Our outpost cabins are more secluded, located within a few miles of our main lodge, but are still on beautiful Shikag Lake. Two have sand beaches and sleep six to eight people. 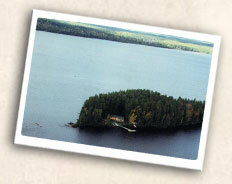 The third outpost is located on a private island and sleeps eight. To accommodate the main activity of the week — fishing — the outposts are outfitted with 16 foot boats with floors and 15 hp motors. The cabins are equipped with solar lights, hot and cold running water, indoor showers, propane water heaters, fridges, ranges and grills. Have a problem? Need something? Boat over and let us know. We'll help! Moose Point is again offering food packages at an additional cost. This is great for avoiding the hassles of shopping. We have included some suggestions if you would like to do your own shopping. Arrangements have also been made with 2 local grocery stores that will shop for you. The Super One grocery store is open 24 hours and is located in International Falls. You can shop when you arrive or call, fax or email ahead and they will have it ready for you. Super One can be phoned 1-218-283-8440, faxed 1-218-283-8544 or e-mailed at super1@northwinds.net. They also have a website www.s1foods.com. Canada customs allows a reasonable amount of groceries duty free. In Fort Frances, Einar's Foods will pack your groceries for you and deliver them to the airbase the day before you cross the border. Northern Wilderness has cooler and freezer space for this purpose. Einer's foods can be reached at 1-807-274-5368 or faxed at 1-807-274-5369. Ask for Ron or Brian. We suggest you pack your dry goods at home and order the meats and fresh foods.